OMG!!! I love the last outfit!!! gorgeous & original whit that purse!!! Awesome options!! I agree...more is definitely more on Christmas :) I love the forth outfit!! So girly and classy!! Love the soft colors and that kitty clutch!! Great choices! I adore the bow ring and pearl cuff. I'll be wearing gold nail polish for Xmas. All the outfits are great, but my favorite is the third one. Love the dress and the shoes, which suits so well with this wonderful time of the year. Have a great week-end, my dear! All the outfits are gorgeous, but my favorite is the third one cos I love the dress and I think that the shoes suits very well with this most wonderful time of the year. 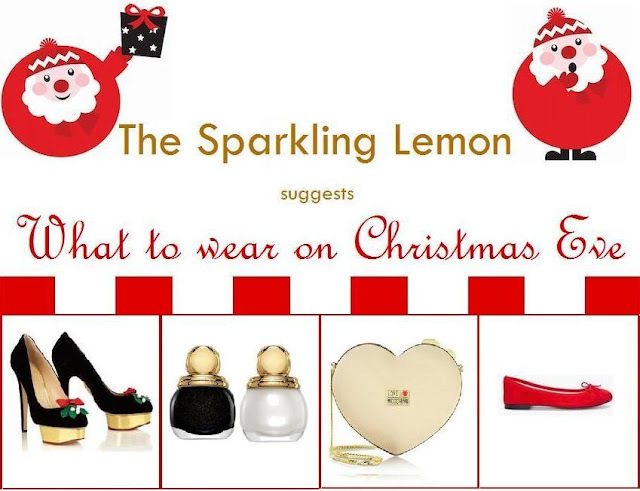 great choices and actually I have a problem with christmas outfit because I don't know what exactly I should wear. I have one looks in my head but in Poland we have 3 christmas day so I should have 3 outfits to family dinner. los zapatos negros me encantan!!! So nice outfits. Have a great day. And the dior nail lacquer! I love all that you have selected! Cute looks...I love the purple sweater. I leave a comment because i like yuor boog and follow yuo. I don't know how this is possible but I love absolutely everything you've featured here, so many stunning choices! Amazing pieces! I love so many of them especially the cat clutch and the baroque skirt! I love your picks!! Really cute looks!! I love all these items! Perfect selection for Xmas! of course we can follow each other, I'm following you now and I'm waiting for you! 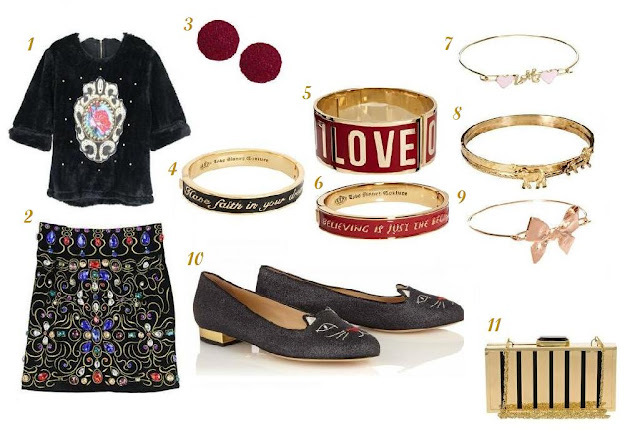 In love with the cat shoes and the feather bracelet! Thank so much for your comment! Yours mix is absolutely amazing! First is the best. Maybe you'll have time to visit my blog and follow if you like. and thank you for the comment on my blog :) yes, i would love it if we can follow each other, i've done so already! Thanks! Of course that I want to follow each other. I'm going to do it right now. Love your selections! My absolute favorite is the last one! Awesome sets! Love these garments and accessories!!! Thanks for stopping by and commenting at my blog dear! Like your blog, following you on GFC! Hey thanks for your sweet comment! 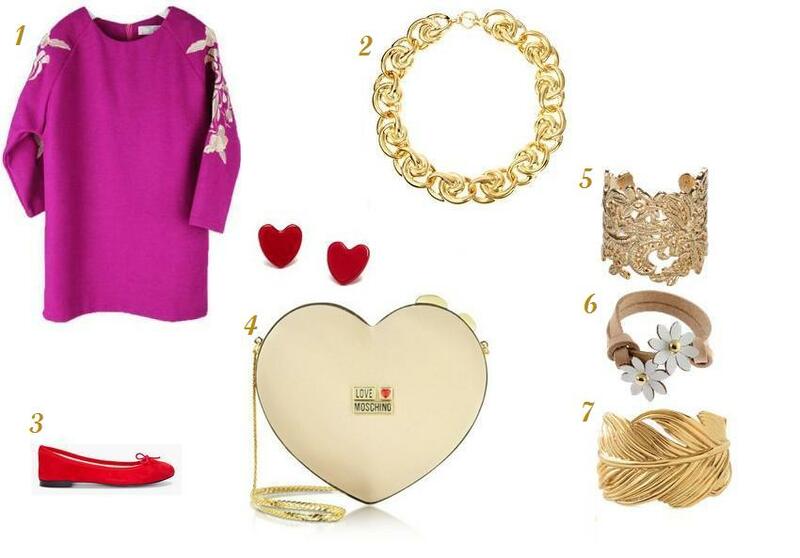 The red flats looks so cute, I also like the bow brzcelet and the last outfit!! !